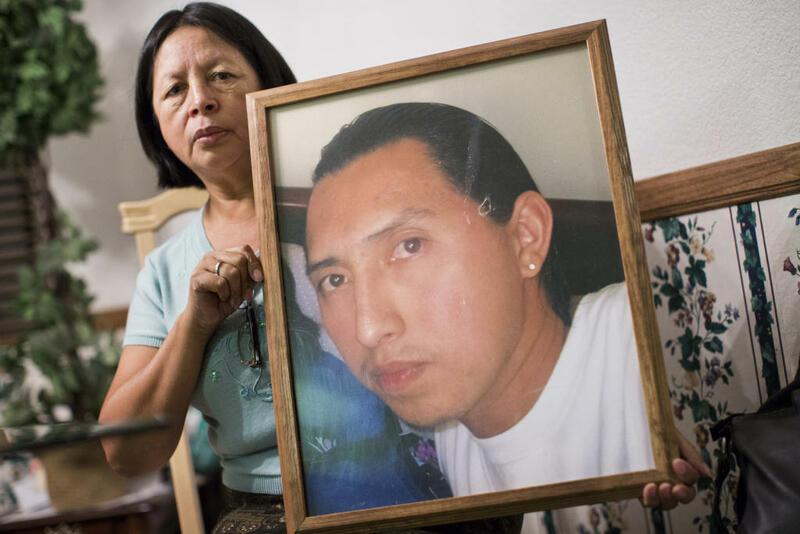 Carmen Cobian holds a photograph of her son, 26-year-old Christian Cobian, who was shot and killed by Los Angeles County Sheriff's deputies in January 2012. Cobian is among the 375 people shot by on-duty police officers between 2010 and 2014 in Los Angeles County. Take, for instance, the nation's second-largest metro area, where NPR member station KPCC in Pasadena, Calif., has created a database of shootings by law enforcement officers in Los Angeles County from 2010 to 2014. KPCC analyzed paperwork from the Los Angeles County District Attorney's office, which reviews police shootings; the L.A. County medical examiner provided the ethnicity of fatal shooting victims. During those five years, KPCC found, police shot 375 people; no officers were prosecuted. Of the people shot, about one in four was unarmed. And 24 percent of those shot and killed were black, while African-Americans make up 8 percent of the L.A. County population. The dataset also includes a breakdown of factors such as the justifications given by police who shoot suspects. For instance, 148 people were shot for moving their hands out of sight or reaching for their waistbands; of those, 47 turned out to be unarmed. "[Michigan State University criminologist William Terrill] said he doesn't think missing hands alone are enough to justify self-defense. Los Angeles Sheriff's Department Commander Rod Kusch, whose homicide bureau investigates all deputy shootings, disagrees. 'There is nothing that requires us to actually wait and see the gun or wait to see the knife,' he said. Deputies' 'background, training and experience' with armed suspects triggers a self-protection response when a suspect's hands disappear, he said." American police have considerable leeway in these situations because of two Supreme Court rulings in the late 1980s. In essence, the court held that officers may use deadly force if they have a reasonable belief that the suspect poses imminent danger of bodily harm to them or someone else. In addition, officers may not be judged based on information they didn't have at the moment they employed deadly force. In fact, on Monday, the Supreme Court bolstered the protections for officers, when it ruled that an officer in Texas could not be sued for shooting into a fleeing car from a highway overpass. Police say these standards are only fair, and without them they would live in constant fear of being second-guessed after the fact. They say if they had to worry about being prosecuted for honest mistakes or for misreading a threat, they wouldn't be able to do their job. On the other side, groups such as Black Lives Matter say this benefit of the doubt has gone too far. They say prosecutors are too deferential to police, and overly aggressive use of force routinely gets a pass. Missing from this debate are good numbers. The federal government has tried — and failed — to get police agencies to report details about the use of deadly force. FBI Director James Comey often complains about how little data Americans have to work with, when debating policing and race. Even some police organizations say it's a problem; they say the current national discussion relies too much on anecdotes and high-profile incidents caught on video, and they say better statistics would create a more sympathetic view of how police use force. The federal government isn't about to require police agencies to start reporting these numbers, but it is experimenting with the next best thing. The Bureau of Justice Statistics has a pilot program to gather detailed information about "arrest-related deaths" in America — and they're going to use "open-source data" as a basis for their statistics. In other words, they'll draw on information that media organizations such as KPCC are collecting on police shootings. Equipped with these numbers, the BJS will then ask police agencies directly for more information on the cases that have been identified. We're going to talk about something that has been missing from our national conversation about police shootings - reliable statistics. Across the country, there is no reliable government tally of officer-involved shootings. But that is starting to change. Here in Los Angeles, our member station KPCC obtained and reviewed records of on-duty police shootings for five years. 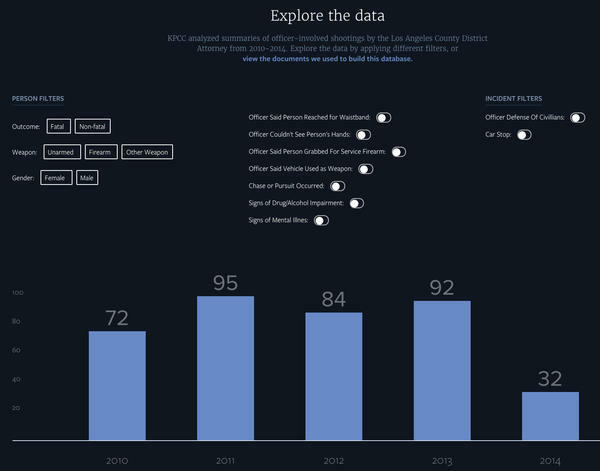 They've put together a huge database that is the first real picture of police shootings in all of LA County. And KPCC's Frank Stoltze is with us here to talk about it. And, Frank, we'll get to the findings in a minute. But first, can you just tell us about this project and the records that you reviewed? FRANK STOLTZE, BYLINE: Yeah. Collecting data in LA County is especially challenging, with the LAPD, the sheriff's department, dozens of smaller police agencies, from Redondo Beach to Pasadena - policing an area with 10 million people. So KPCC embarked on an in-depth investigation focusing on collecting data from the one agency that reviews all police shootings, and that's the LA County District Attorney, which decides whether an officer's actions were lawful. The DA issues a letter on each and every shooting summarizing what happened and explaining why, in the DA's opinion, the shooting was legal. MCEVERS: And Frank, you and your colleagues looked at cases from January 2010 to December 2014. What did you find? STOLTZE: Well, we found at least 375 people were shot by on-duty police officers over that five-year period. About half of the shootings were fatal. And, not surprising, black people were fatally shot at a substantially higher rate, at nearly triple their proportion in the population. One of the biggest findings, though, was that a quarter of all people shot by police over this five-year period were unarmed. MCEVERS: And we have a piece here about two of those unarmed men who were fatally shot by police by KPCC reporter Annie Gilbertson. ANNIE GILBERTSON, BYLINE: Michael Nida had a big night planned. He and his wife, Naily, were going to Hollywood to celebrate his 32nd birthday. JEAN THAXTON: They weren't gone from the house - I swear, they weren't gone from the house as soon as 15 minutes. GILBERTSON: Jean Thaxton, who raised Nida, was babysitting for the couple. It felt like they had just said goodbye when the phone rang. THAXTON: And I said hello. And Naley's on the phone, and she's saying, he's down, he's down, he's down on the ground. And I said, what do you mean, he's down? What are you talking about? She says, Michael - Michael, they shot him. I said, who shot him? GILBERTSON: The police in Downey, a working-class suburb south of Los Angeles. It was around 9:30 on October 22, 2011. A few weeks ago, friends and family gathered on a busy street to mark the anniversary of Nida's shooting. UNIDENTIFIED WOMAN: He was at the gas station here and he ran across the street. GILBERTSON: According to the district attorney's summary reviewed by KPCC, Downey police were investigating an ATM robbery nearby, and they tried to question Nida but he ran. Officer Steven Gilley lost sight of Nida's hands. Gilley thought Nida was going for a gun, and shot. UNIDENTIFIED WOMAN: Came down through the driveway there, came out, stumbled here in the street right here - right here - and died. GILBERTSON: He was unarmed. As soon as she got the phone call, Thaxton rushed to his side. THAXTON: They had him in a stretcher and they were using that bagging thing for him to breathe. GILBERTSON: She says she's still haunted by what she saw. THAXTON: I saw the wound right here, right here, in his chest. GILBERTSON: Officer Gilley, who's now Detective Gilley, declined to comment. So did the department. But LA County Sheriff Jim McDonnell says police across America are trained to watch a suspect's hands. JIM MCDONNELL: They tell people to put their hands up, take your hands out of your pockets, put your hands up, let me see your hands. The hands are what kill you. GILBERTSON: Officers have good reason to be cautious. KPCC's investigation found three-quarters of suspects were armed when officers shot at them. McDonnell says, what are cops supposed to think when the suspect doesn't put his hands up like he's told? MCDONNELL: We're putting an officer, to represent the rest of us, in harm's way. What, reasonably, can we expect them to do when faced with similar circumstances? GILBERTSON: The person who decides whether a shooting is reasonable - or, at least within the law - is District Attorney Jackie Lacey. Her office investigates every police shooting in Los Angeles County as a possible crime. JACKIE LACEY: We understand the public's anger over what they perceive to be as unjustified shootings or killings, and we do our very, very best to shine light on whatever decision we make. GILBERTSON: For the past 15 years, the decision has been the same every time. In case after case, prosecutors found on-duty officers shot legally because they feared for their lives or the lives of others. And it doesn't matter if that fear was real - or if the threat was imagined, like in the case of Dexter Luckett. GILBERTSON: That's Luckett's mom, Janice Johnson. JOHNSON: ...But then they twist it and say his hand dropped, you know, like he was reaching for something. GILBERTSON: Luckett was outside a party in Bellflower, another working-class town in South LA County. He was 23 years old, drinking beer with a friend, when the sheriff's deputies showed up. BOBBY WATKINS: This is Tuesday night. It's a party. He's drinking beer. GILBERTSON: Bobby Watkins is Luckett's stepdad. WATKINS: So he was smoking a little reefer. What's the big deal? GILBERTSON: Someone had called 911 saying they heard gunshots. Deputies told Luckett to put his hands on the hood of the patrol car. He put his beer on it instead. Sheriff's Deputy David Mailloux told investigators Luckett dropped his other hand behind him. Afraid Luckett was going to shoot him, Mailloux fired first, a single fatal shot to the chest. That's the official account from the DA. Mailloux wouldn't comment. Luckett's stepdad, Watkins, says there was no good reason to shoot. WATKINS: It was not as if he was combative. He was not armed. He was not in the act of committing a crime. GILBERTSON: Friends say maybe he was just pulling up his baggy pants. Watkins says the tragedy of it is that Luckett had big plans. He had enrolled in trade school just that morning. WATKINS: He was happy about himself. He - happy that he achieved something. GILBERTSON: He says Luckett wanted to be a border patrol agent. MCEVERS: That's Annie Gilbertson of member station KPCC. KPCC reporter Frank Stoltze is with us, and we've got NPR's law enforcement correspondent, Martin Kaste, on the line. And Martin, we're talking about 375 officer-involved shootings over five years and, yet, no officers were prosecuted. Is that normal, nationally? MARTIN KASTE, BYLINE: That fits the pattern. In the last couple of decades, prosecutors have shown a lot of leeway to law enforcement officers for use of force. Basically the standard is, if that police officer reasonably believed to be in danger or thought the suspect posed a danger to somebody else, they're allowed to use force, even if it's deadly force. MCEVERS: And looking at this KPCC database, you have to wonder, why isn't data like this available nationally? KASTE: Because the U.S. is a lot like LA County. Policing is completely decentralized in this country. We're not even sure how many agencies we have. It's, roughly speaking, 17,000 or 18,000. When the feds ask for statistics like this, they're asking for it on a voluntary basis. And statistics aren't often forthcoming in a way that's reliable. What's interesting now is that the federal government is actually looking at media sources - things like this KPCC project - as a source of data in police-involved shootings. MCEVERS: And, Frank Stoltze of KPCC, what's next with this project? STOLTZE: Well, one thing is, we're going to look at disparities among police department. It appears the LA County Sheriff's Department, for example, shoots more unarmed people than the LAPD. Cops will say some of these are inevitable. But there's no industry standard. What's the lowest number of unarmed people you can get to? MCEVERS: That's Frank Stoltze of member station KPCC. MCEVERS: And NPR's Martin Kaste.